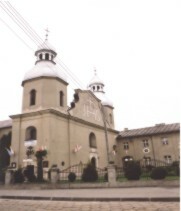 The church of Pauline fathers in Wieruszów. The history of Paweł Bryliński, the greatest sculptor of southern Wielkopolska, begins in Wieruszów on 21st June 1890. The sculptor's date of birth was set one hundred years after his death in 1990 by Michał and Ewa Chmielewscy and published in 2002 in Ewa Chmielewska's book entitled "Saints at the Polish Crossroads - Southern Wielkopolska. Part 1. The Sacred Pole of Paweł Bryliński in Chotów."